Tuning Tool for E Bikes with the Yamaha PW-X (LCD-X display). Up to 99 Km/h. The SpeedBox 2 is a processor-controlled tuning tool. The version has been especially manufactured for electric bikes with Yamaha PW-X engines. These new Yamaha systems are being used in, for example, Haibike SDURO or EVO electric bikes. The Yamaha PW-X drive system has been specifically developed for E-MTBs, so the engine is very powerful. 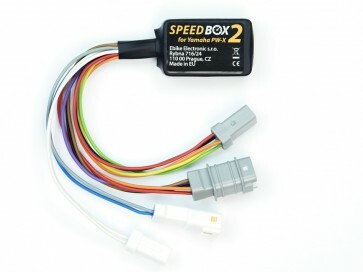 The Speed Box 2 enables you to extract the full power out of your Yamaha PW-X engine! This recommendable tuning tool takes away the 25 km/h speed limitation of your Yamaha PW-X motor completely – that means, you can drive much faster with full engine support. Your electric bicycle´s maximum speed will only be limited by your pedalling rate. Important: Your Yamaha display will still show the correct speed – even if the SpeedBox 2 is activated. Other data like maximum- and average-speed, range and daily mileage will be displayed correctly, too. Please note: not compatible with Yamaha PW-X / PW-SE 2019 and display A & C! You can activate the SpeedBox 2 at any time by briefly pressing the WALK button. After that, your display will briefly show a speed of 9.9 km/h. That means, the SpeedBox is activated and you can (theoretically) drive up to 99 km/h with full engine support. If you want to deactivate the SpeedBox, simply press the WALK button again. Now a current speed of 2.5 km/h will be displayed for a few seconds. That indicates that the tuning tool has been deactivated and the engine support will stop at a speed of 25 km/h again. The installation of the SpeedBox 2 is very easy. It can be intuitively done at home. You do not need any special technical skills. There is no calibration required. All connectors are colour coded, which means a faulty connection is almost impossible. The connection of the SpeedBox 2 to the Yamaha engine is absolutely non-destructive – that means, you can restore your electric bike´s original condition at any time. According to the manufacturer, only electric components of the world´s leading manufacturers are being used to produce the SpeedBox 2 device. By the way, its processor has even been certified for the automotive industry. The SpeedBox 2 is very robust, durable and waterproof. Das Tuning sitzt im Yamaha PW-X E Bike Motor.